Beckon is The Source of Truth for Marketing™. Rock-solid data management + real-time marketing intelligence for better, faster decisions. Beckon [ANALYTICS] is purpose-built to deliver automated, real-time analytics based on marketing best practices. Get omnichannel insights in the language of marketing, and clean, aligned data to power advanced analytics all right out of the box for fast time to value. Beckon [ANALYTICS] comes preloaded with the rates, ratios, diagnostics and KPIs that brands and marketing leaders have long relied on. Hundreds in all. Paid-to-earned media ratios that reveal exactly how much consumers are amplifying your message. Run-rate calculations that project how you’re tracking. Efficiency metrics. Effectiveness ratios. The list goes on. And of course, you can build your own, too. Ask and you shall receive. Just ask a business question using Beckon’s natural-language interface. What happened to CPM when we turned on programmatic in two markets? Which messaging is resonating most with our target audience? Which agency delivers the most net new leads per dollar paid in fees? Beckon [ANSWERS] gives you the answer immediately, in the form of beautiful charts, graphs and tables. Explore performance by products, brands, regions, campaigns, channels, customer segments, agencies or any combination thereof. Because the data is perfectly aligned, normalized and tagged in Beckon, you can slice and dice all the way to the detailed answer you need to take action. Answer in hand, you know exactly what action to take next. Tell a powerful story of marketing’s impact on the business. Bring data, images, rich media and the voice of the customer to life in one beautifully simple dashboard. Leverage Beckon’s suite of best-practice reports, or build and publish your own. 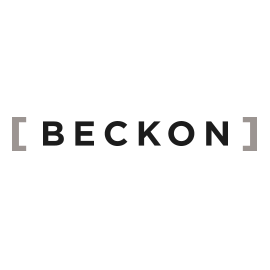 Sitting atop Beckon’s rock-solid data management platform, Beckon [DASHBOARD] delivers far more than channel metrics side-by-side on a single screen. It gives you omnichannel marketing funnels, aggregate engagement metrics, ratios between owned and earned impressions, and much more, bringing the interactions between channels to life. Beckon [DATA] is rock-solid data management purpose-built for marketing. Beckon [DATA] pulls in all your spend and performance data, then cleanses, blends, normalizes and enhances it, setting the stage for business-building insight. See your marketing data like you’ve never seen it before. United. Normalized. Integrated. Aligned. Accurate. Continuously updated in real time. Beckon [ENTERPRISE] lets you tailor permissions and controls with ease and manage teams at enterprise scale. You get all the customizations and user-management functionality you’d expect from enterprise software like calendar configurations and preferred currency. Beckon’s SOC 2-compliant platform is secure, scalable and tailored to your business. Good data hygiene and governance means data and insights you can trust. How’s marketing doing? Sure, we’ve got spreadsheets stuffed with impressions, clicks, likes, TRPs and every other metric, but what we need is true omnichannel insight. How well is marketing driving the customer experience end to end? Where are things working well? Where are we falling down? How efficiently are we driving business outcomes? Beckon [SCORECARD] gives you that insight. Fully customizable for your business, our marketing scorecards have three different performance comparisons built right in. Get the context and perspective you’ve been missing in a concise, automated report. The big picture of marketing performance, at a glance, in real time. Study reveals Beckon customers gaining more than $8.5 million in benefits over three years.